I think newspapers may be my favorite item to research in my family tree. I love that is real time, I love that it can tell a bit of a story (especially when those are few and far between in my family), I love the detail given in some of the older newspapers but I love it most when I find a mention of a family member. Recently I discovered that Newspapers.com has more issues of The Gazette a Montreal newspaper. Newspapers.com has issues of The Gazette from 1857-2018! Maybe these papers have been there for a while but they were a discovery for me. I spent the next three days researching my Dever, Norton & Jordan families and found numerous articles to add colour and detail to the lives of my ancestors. My favorite find was the wedding announcement for my grandparents. My grandmother had kept a lot of genealogy-related items but other than a studio picture in her wedding dress I have very little information about her wedding. But thanks to finding this clipping I know details about what she was wearing, her bridesmaids, her mother and even her adorable flower girl. At the wedding of Miss Beatrice Mary Victoria Jordan, only daughter of Mr. and Mrs. P.J. 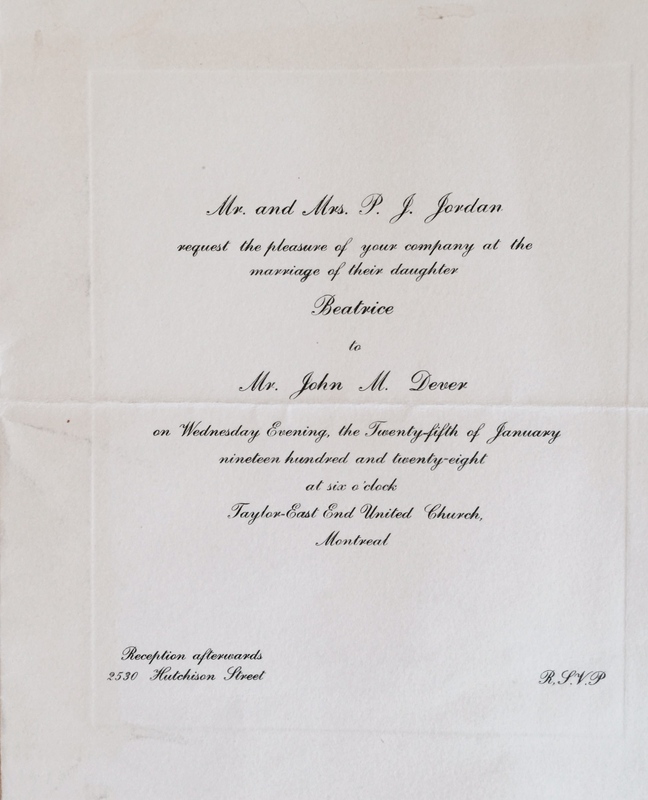 Jordan, of Outremont, to Mr. John Dever, son of Mr. S. Dever and the late Mrs. Dever, of Montreal, which will take place this evening at six o’clock at Taylor-East End United Church, the Rev. A. McTaggart will officiate. The bride, who will be given in marriage by her father, will wear a gown of white crepe back satin; her frock, which is fashioned with a bloused bodice and an uneven hemline, is draped at the left side and trimmed with an ornament of pearls. Her veil of tulle, banded with Chantilly lace in cap effect, will be caught at the sides with clusters of orange blossoms. She will wear silver shoes and will carry a shower bouquet of lily-of-the-valley and butterfly roses. Miss Isabel Norton, cousin of the bride, and Miss Lillian McGregor will be bridesmaids, and will be gowned in bouffant frescos of chiffon taffeta with trimming to match their gowns, and will carry arm bouquets of Columbia roses. Miss Norton will be in pink and Miss McGregor in mauve. Little Miss Dorothy Cartwright will be flower girl, and will wear a frock of pale blue chiffon taffeta and a taffeta poke bonnet to match, and will carry a basket of butterfly roses. Mr. William Dever will act as best man for his brother, and the ushers will be Mr. Allan Jordan, brother of the bride, and Mr. Walter Dever, brother of the bridegroom. Mr. J. McLean Marshall will play the wedding music, and during the signing of the register Miss Lillian McHarg will sing. Mrs. Jordan mother of the bride, will be gowned in steel blue crepe black satin; she will wear a black silk hat and carry an arm bouquet of Freedom roses. Miss Edna Dever, sister of the bridegroom, will be in a gown of white georgette beaded with crystal, and will wear a black hat. She will have an arm bouquet of Premier roses. Following the ceremony a reception will be held at the home of the bride’s parents, and Mr. Dever and his bride will later leave for New York. Going away the bride will wear a gown of blue pissy-willow silk, a small blue silk hat and a Hudson seal coat trimmed with squirrel. They will reside in Outremont. Mrs. S. Jordan and Mrs. J. Frost, of Kingston, Ontario will be among the guests from outside the city. Does anyone else when reading about the dresses that were worn, want to recreate them? And how about that seal coat trimmed with squirrel! Searching can take some time but the rewards and discoveries are worth every second. 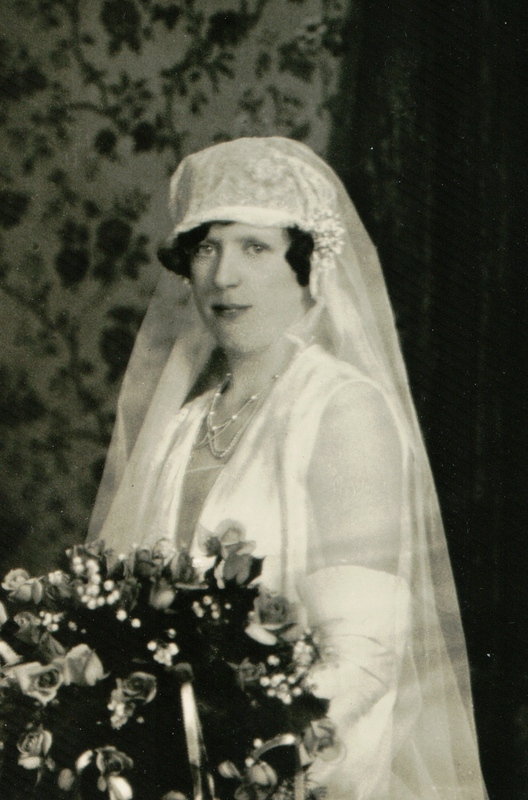 Beatrice Jordan on her wedding day. Witnesses were William Dever & Ida May Norton. I do not have a photo of the happy couple together, but I love the photos of my grandmother.